Olark is a company that seems to exclusively focus on live chat — at least in their current phase. With their devotion to chat, it’s not surprising that it’s a rich, deep and intuitive tool for having conversations with site visitors. Auto-translation: If you’re customers are all over the world, you may be able to talk with them, too. “Co-browsing”: The ability to be on the same page as the person you’re chatting with. Could be super helpful for both sales and support. All of these features mentioned are called “PowerUps” and are available on the paid plans. Gist’s live chat tool doesn’t have these specific features, per se (save for “insights”, we just call it “event tracking”. That said, our advantage is in the all-in-one nature of our platform. Our live chat seamlessly integrated with our help desk ticketing system. With Olark, you’ll need a paid plan to integrate with your ticketing system (if it’s supported). Or, use Zapier to connect them (if possible). One of the most common uses of live chat for businesses is support, which gives us that advantage. It’s what they do. And if you’re only interested in a live chat product, it’s a good tool. Olark wins the live chat category of this comparison. As we barrel toward the roaring 2020’s, live chat and chat bots will likely go together like peanut butter and jelly. Gist offers a linear bot creation tool that does not require coding. You can have a fully-functional bot, like the ones I just mentioned, in about 15 minutes. Then, set the display conditions (the when/where/who of the bot being shown) and set it live. Bots can even be used to show common issues (and even link to knowledge base articles) or to point traffic in the right direction. 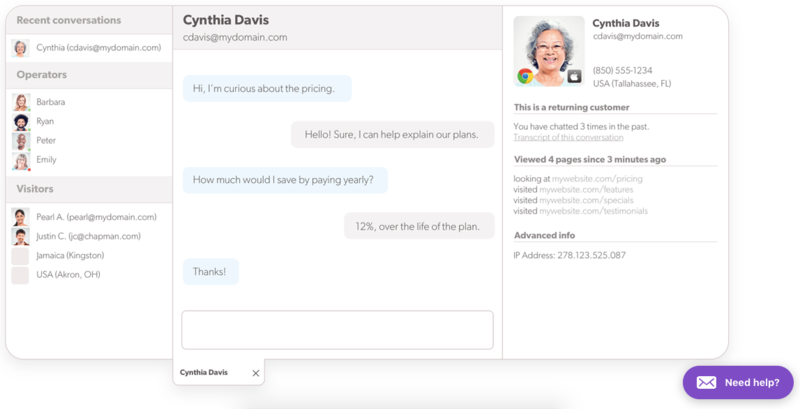 Olark doesn’t offer bots, but it could be a feature in the future given the closely related nature of the two features. Using bots either when your team isn’t around or all the time is easy using Gist. We take the win here. Clicks within emails, opens, views, etc. And all of these events are connected to either a subscriber name or the IP of the visitor. And these events stay for the life of the visitor, user or customer. These events can then be used to create tags to be used for marketing automations. Olark does have a bit of an event tracking feature. While it can’t be used for automations within their tool, there is some functionality. Enough to include the comparison. The information available is useful. For instance, users can see past conversations with customers. If needed, you can quickly open up these past conversations to handle issues even faster. Other data that you can see (depending on if you’ve input it or said data is readily available) includes; interests, social profiles and certain demographic or company details. This information could be imported to or from certain CRMs and other tools, if you have the integration. Olark’s “Visitor Insights” are neat, even though they are for live chat only. Gist’s event tracking is much more robust and useable. The win goes to Gist. What happens when your live chat needs to become a call. Gist’s meeting scheduler tool is good for this and other functions, too. Any meetings you need to set, a scheduler tool makes it easier. Olark does not have a meeting scheduler solution. Gist wins the meeting scheduler category since Olark doesn’t have a similar solution in addition to their live chat product. Chat tools and customer support go together very well. Today’s buyers want to know they can reach you quickly with their questions, concerns and problems. And live chat is a really great way to reduce the support burden. You don’t have team members on the phone for several minutes with each ticket. Text requires brevity on the part of your customers, which creates speed in handling issues. Our help desk allows you to organize and add team members to keep the process clean. Gist’s help desk includes ticketing and is primarily handled with our live chat tool. Both of these work in conjunction to provide necessary tools for offering great customer support. Olark does not have a help desk at the time of writing this comparison. With out a comparable feature, Gist’s help desk is the winner here. If you plan on using live chat for support, it could weigh in on your chat tool, too. In addition to a help desk, many businesses will want to include a knowledge base full of articles relating to processes, product features and other common issues for your customers. Using knowledge base articles with live chat and help desk can seriously reduce the support burden. For instance, when a customer opens a support chat for a common question. Your reps can just send the link to the appropriate KB article and close the ticket within seconds. Olark does not offer a knowledge base solution at this time. The knowledge base category goes to Gist. Live chat is the forefront of conversational marketing — no argument there from me. That said, it’s not the only communication tool that should be in the bag of your business. Email is still king for a number of reasons. Live chat requires chat participants to return to your site or application in order to continue the conversation. Emails can travel to the inbox of your leads and customers. The money is still in the list. In a world of reduced organic reach, it pays to build your own community and own it. Automation is strong. You can schedule emails in a campaign and create messages to be sent based on user behavior. This type of automation is not yet available in live chat. Gist’s email marketing feature works well with our other tools, especially event tracking and marketing automation. Olark does not do email. Gist’s email marketing wins. Add that to the fact that it works so well with our automation and workflows and it’s no contest. Gist’s marketing automations (very soon to be visual workflows) allow for other, more complicated functions as well. Olark has some intuitive things for it’s chat, but it doesn’t offer any automations. Gist’s email and automation tools are powerful when used together. Without comparable features from Olark, the win goes to Gist. Gist has a lightweight forms product that gives you the ability to create 6 different types of forms. These forms can then be put on your site based on a variety of display conditions. Your forms can be shown on certain pages, specific times and a number of other conditions to ensure the right forms are showing up in the right place. These forms can then be used to collect contact data for email marketing and can also be used to set up automations (e.g. send a lead magnet upon subscription). Obviously without email, Olark doesn’t need to offer forms as part of their tool. Gist clean sweeps the email category and wins here with forms. Olark is a streamlined chat tool and Gist is a full marketing, sales and support platform with multiple tools. Reviewing the pricing for comparison is difficult. So, I’ll just share the basics about each pricing structure and then give my thoughts. Olark has two plans — Free and Paid. The paid plan is available month-to-month ($17/mo), annually ($15/mo) and bi-annually ($12/mo). The free plan gets you very basic access to the chat tool and 20 chats/mo. The paid plan gives access to every feature and integration available. 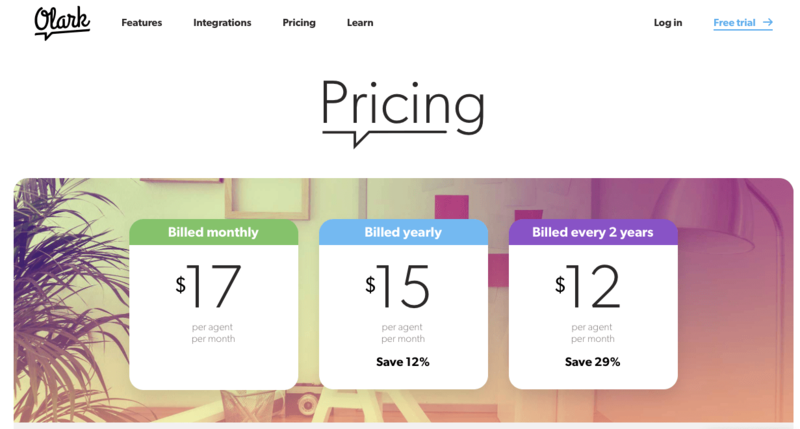 Gist has tried to simplify our pricing as well. Free: For free you have access to our live chat, meetings and up to 500 contacts with unlimited chats per month. Standard ($29/mo): At this level, you get email marketing (up to 2500 contacts), help desk, knowledge base and limit bot functions. Pro ($79/mo): Everything we have is yours for using at this level. While Olark is less expensive, Gist has so much bang for the buck. Even when comparing free plans, you get a more functional live chat and the ability to set meetings. Based sheerly off of the amount of power given in all of our plans, the pricing category win goes to Gist. There probably aren’t many businesses who are looking for a live-chat-only solution. But if you are just looking to add this one tool to your current stack — Olark is a fine live chat option. For those wanted to condense the number of tools, reduce the number of integrations which can break down at times and have their entire marketing, sales and support structure in on dashboard — Gist is the tool of choice. Olark is a great tool for live chat, but the overall win in this comparison goes to Gist. If you’re looking for an all-in-one solution, start a trial today! Kickstart your 21-day free trial now. No credit card required. Switch to Free plan after trial. A unified marketing, sales, and support platform that serves as a single source of truth for the entire journey from website visitor to happy customer.